The United States Twenty Cent value is based mostly on the rarity of the their mintage but all of them are valuable. However a couple of dates and mints have low mintages but one has an even lower survival rate; the 1876-CC. The 1876-CC has a reported mintage of 10,000 and the 1876 (no mint mark) has a reported mintage figure of 15,000 but the 1876-CC didn’t survive in as many numbers and is only known for around 20 examples. So it’s worth much more than the 1876. For comparison the 1876-CC is worth around $300,000, and up, but the 1876 is worth $250 and up. So mintage figures can sometimes be confusing when it comes to value. 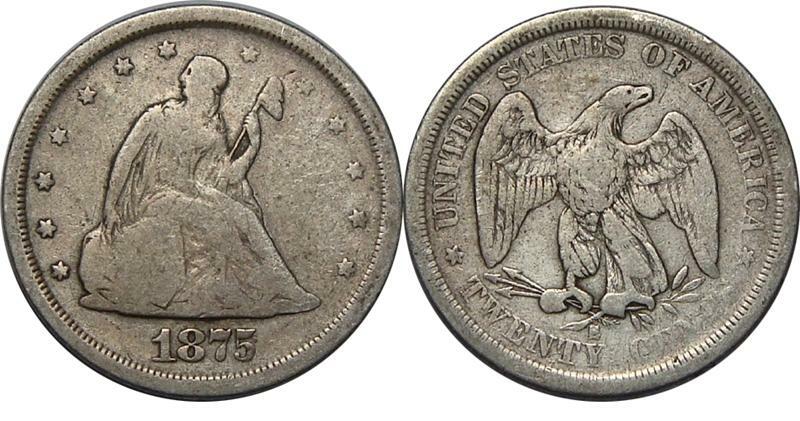 The 1875-CC is another rarer date and mint that’s worth $300 in G4 (Good) and increases in value as grade improves. All common date and mint business strike dates are worth at least $100 or more in the G4 grade. You can buy them cheaper than $100 but they are most likely cleaned or damaged in some way. 1877 and 1878 dates are only known for proof strikes and they’re worth thousands of dollars each, even in the lower grades. (Proofs can be circulated). All dates are known for proofs strikes and the deep cameo examples are the most valuable with starting values at or above $1,100 each. You also have a special strike (SP) 1875-S and only twelve were minted and they’re worth thousands of dollars each. Grade condition is a huge factor in Seated Twenty Cent value with MS (Mint State) examples being the most valuable. It’s difficult to find a MS Twenty Cent piece for less than $1,000 in mint state. United States Twenty Cent values is determined by the mintage, survival rate and grade of each date and mint.